Loose or badly fitting kitchen cabinet doors are a common problem. Most cupboards these days use a concealed steel hinge which are sprung so the door stays closed without the need for any catch. They are fairly easy to adjust if you understand how they work. Whilst various brands will vary slightly essentially they come in two parts one screws to the door with two door holding screws. The other part screws to the cupboard frame with two cupboard holding screws. They slot together and are held in place with a locking screw which tightens up to hold the door in place. Some more modern hinges also have a sprung loaded quick release catch so you can remove the door simply by pulling back the catch. Finally there is and adjusting bolt which is used to move the door left and right, or change the angle. 1 Make sure the locking screw C is tight. If this has come loose the door may have slid in or out from its original position as the two parts of the hinge slide against each other. When the door is open as shown aim for approx. a 1mm gap between the door and the cupboard. Having made sure the doors aren't loose you can if necessary then make small adjustments if they aren't properly aligned. 1 To change the vertical height . Undo the two adjustable cupboard screws B on both hinges. 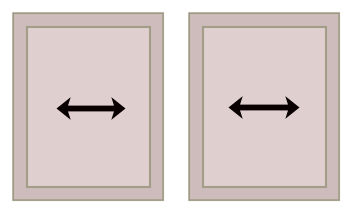 2 Adjust the doors side to side slightly by turning the adjusting screw D on BOTH hinges on each door. You may have to slightly release the locking screw C to do this. Make sure it's tight afterwards. 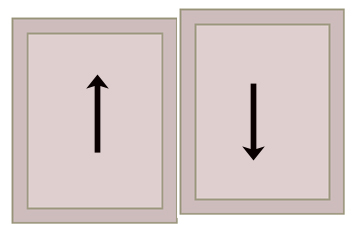 3 Adjust the angle of a cabinet door with the adjusting screw D but this time only screw either the top or bottom screw. For a bigger adjustment screw the top one way and the bottom the other!!!! You may need to slightly release the locking screw C to do this. Make sure it's tight afterwards. 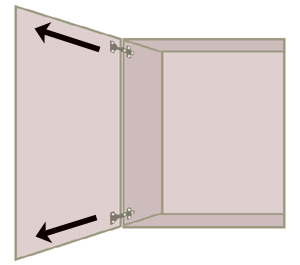 If the door is not closing properly or is making creaking sounds it may be binding on the cupboard frame. Look on the side where the hinges are as you close the door. 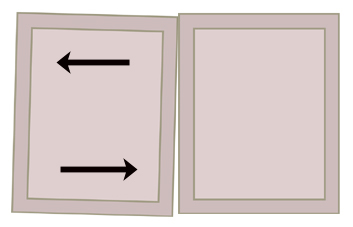 The door may be touching the cupboard frame as it closes. (binding) To stop this you need to adjust the door out towards you slightly. 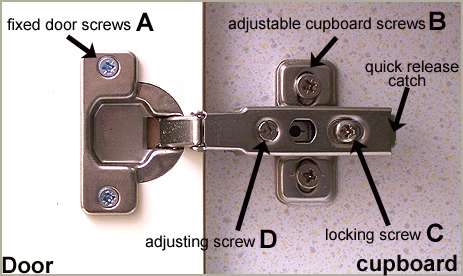 Unscrew the locking screw C on both hinges. The door can now slide in and out a little. Pull it towards you slightly and re-tighten. The ideal gap need not be any more than 1mm.